Study Abroad: Why Study in France, Europe ? Why Study in France, Europe ? France is situated in Western Europe official known as the Republic of France. Its capital is Paris and the official language is French. Neighboring countries of France are Spain, Germany, Italy, Belgium etc. France has the world record of having 12 different standard time zones. Few popular cities, France are Paris, Bordeaux, Marseille, Nantes, Lyon etc. The education system of France is counted in one of the best education systems in the world. In France, the students get the opportunity to meet the multi-cultured society coming from different areas of the world. France has a marvelous heritage of philosophers and great thinkers. World Famous authors, artists, filmmakers, mathematicians etc come from France. You should come to Seek Academy for further details about the study in abroad. We are located in Tilak Nagar, Delhi. France is one of the great destinations for tourism and education. When we talk about education it has outstanding research opportunities and development opportunities. Now a day’s France has become a captivating destination for students worldwide. France is also home to many world-famous brands like L’OREAL, CHANEL, LACOSTE, GARNIER etc. International students who choose France as their study destination get Schengen visa which means they can go and do their training or internship to other 25 countries without any problem. For example, a student is studying France and he gets an opportunity to do any training or internship he can move to Germany, Spain, and Switzerland etc. So this is a huge opportunity as international not only get a chance to study at different places but they also get a chance to explore new destinations during their studies. There are several courses in France which are offered in English and due to this international students get a chance to study in Europe. Popular courses in France are Management, Engineering, Philosophy, Art and design, Fashion, Business etc. France’s education system compromises of public and private institutions. The system as whole provides excellent and high-class education quality and as we know programs are available in English and French both so a student has the option to choose as per their preference. As per the research, France is home to more of the world’s 100 most innovative companies than any other country in Europe. France also has the 6th largest economy in the world and 3rd largest in Europe. Chemical industry of France is known as the key sector contributing towards economic growth. While choosing an option for yourself to study at your preferred location always consider to choose the correct foreign education advisor who is aware of in and out of the all the countries and how it can be helpful for your future. When a student will apply for student visa in France he has to go through from two different procedures to get his visa. First will be Campus France interview and then VFS appointment. France is situated in the heart of Europe and its one of the most beautiful places on the earth. While studying English, students get an opportunity to learn French language which is widely spoken all over the world. Having a degree from France and knowing additional language is always a highlight of your resume. After your studies even if you come back to your home country, it will be a great thing and many opportunities will be on your way. Students must be aware of how to use this opportunity in the best possible way and be getting a chance to study in France can help you to achieve both your dreams, education with the best institute and exploring world’s beautiful places. 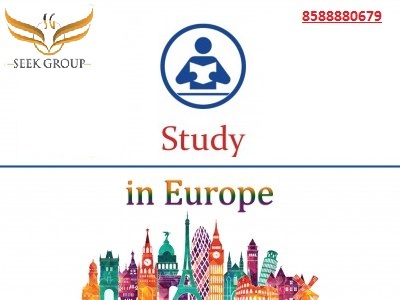 Now a day’s not only the UK, Canada, Australia etc are left as study destinations, Europe is also becoming the favorite destination of students for higher education.